Piper Nigrum, also known as black pepper vine is a tropical vining plant which produces peppercorns which are commercially used to produce the familiar spice, black pepper. 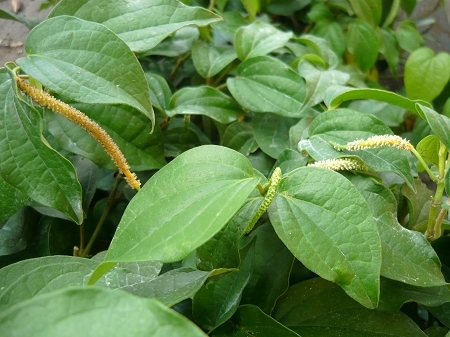 Tender tropical vining plant needs partial to light shade and moist rich soil. Easy and beautiful houseplant in hanging baskets or containers may need trellised. Can grow to 15 ft or more. Peppercorns are produced after the plant flowers. Black pepper is produced from the harvested unripened fruits. Night time temperatures need to stay above 60 degrees for the plant to flourish. Tender tropical perennial zones 11+. Cannot be safely shipped during extremely cold temperatures. Live plant in 3 inch container. I received 2 very nice looking black pepper vines, healthy, very green and strong. They have since grown a bit and have adjusted very well.